The Trump administration unveiled its $4.1 billion budget Tuesday, and the shock waves are being felt far beyond Washington. For many working in especially-targeted agencies, the magnitude of these cuts will have considerable implications. Here in Boston, EPA workers are rallying against the proposed cuts by gathering at the State House in a show of opposition. Essentially, the administration’s cuts decimate the EPA by 31 percent, eliminating almost 4,000 jobs from the agency itself. Efforts to keep clean our streams and waterways are being eliminated, and there are deep cuts to the monitoring of the safety of our tap water (even in communities like Flint, Mich.). Regional conservation efforts are being scrapped, along with funding for environmental disaster cleanup. Wasted food is one of the most significant drivers of climate change. Efforts to reduce and control it are being eliminated under this budget. If food waste were a country, it would be the third largest greenhouse gas emitter behind both the United States and China. 3.3 billion metric tons of carbon dioxide is the byproduct of the harvesting, production, packaging, and transporting of food that ends up rotting in landfills. The water wasted in those same processes is equivalent to the volume of Europe’s largest river. We currently grow and produce more than enough food to feed every single person on the planet, and that includes the estimated 9 billion world population in the next 30 years. As a food rescue in Massachusetts, Lovin’ Spoonfuls runs on the premise that hunger and food insecurity are not problems of supply, but rather of distribution. By summer’s end, we will have rescued and diverted 7 million pounds of food from landfills. Each week, the 50,000 pounds of food we recover reaches more than 35,000 hungry people in Massachusetts. The proposed cuts by the Trump administration not only pose a severe threat to the health of the planet, but threaten public health, too. Along with EPA cuts, over $4 billion is expected to be cut from HUD, where essential Community Block Grants live, and SNAP funding — on which 45 million Americans rely — by more than a quarter. The costs of defunding safety-net programs that feed, house and care for people only sets in motion a higher cost down the road. Keeping veterans and seniors in their homes with nutritious meal delivery offers dignity, respect and ultimately better health. In the world we live in, food is political. But on the ground, the immediate work that can be done is logistical. Tailoring solutions within the supply chain, looking at communities by their demographics, geography and current resources all become valuable factors and tools that we use to move food with intent and purpose, creating best practices for safe, reliable and consistent distribution of healthy nutrition. 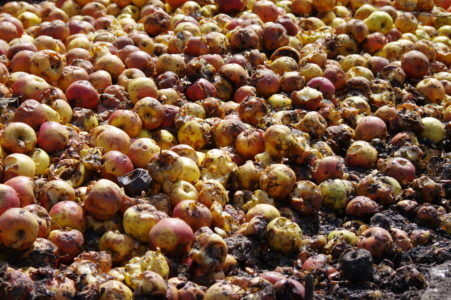 Wasting food is perhaps the most avoidable and solvable problem we’ll see in our lifetime. Reframing hunger and access as consequences of poor or nonexistent distribution rather than supply is our guiding principle. Our work is on the ground, accessible to the community at large each day. But we, like so many other social service providers are limited by policy, and the underlying priorities therein. When managed and stewarded properly, the arms of government that create policy are essential to the health and future of our planet. It is the responsibility of us all to call for the protection and preservation of these agencies. It is time to step up, and step in – to keep and defend these priorities, even when our leaders have abandoned them.